Victorian bulbous art glass vase with an enamel scenic decoration of a house on a lake with a snow scene. Background is pink shading to a while. 5 ¼"
VIC739. Victorian glass rose bowl in the cabbage rose pattern. Pale blue coloring shading to a near white. Creamy white interior color. Fire polished pontil. 4 ¾” diameter, 4” tall. Moser green glass vase with a flaring top and all over enamel decoration of flowers, butterflies, scrolls and leaves in colors of russet, blue, amethyst and white. 5" Excellent condition. Victorian art glass vase in pink shading to white with a white interior lining, and an enamel decoration of gold flower blossoms, leaves and a dragonfly. 7" tall. FRY760. Fry Foval Sugar bowl having an opalescent bowl with an applied blue crystal foot. This line of art glass is becoming scarce and now is the time to add it to your collection. 4 1/2" diameter, 2 3/8" tall. Excellent condition. VIC571. 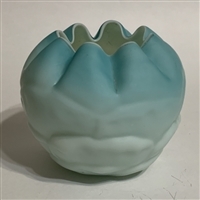 Victorian translucent blue glass basket with white spatter throughout, an applied translucent blue thorn handle, and a heavily ruffled top. 5 ¾" tall, and 6" at its widest point Excellent condition. VIC603. Mary Gregory type cylinder vase with white enamel decoration of a boy. 7 ½" tall. VIC734. 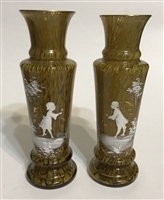 Pair of Victorian Mary Gregory – type vases having white enamel decoration of a boy and a girl, both holding a flower in a wooded scene. The base glass is an amber mottled glass. Guaranteed to be old and attributed to Bohemia. One vase has a chip at the rim. Otherwise the pair is in excellent condition. Priced accordingly. 6 ½” tall. VIC784. Mary Gregory- type cranberry vase with white enamel decoration of a boy holding a flower surrounded by shrubs and trees. Old and authentic. 7 1/2" tall. Excellent condition. VIC788. 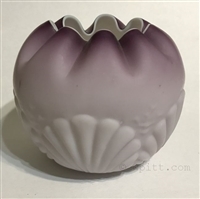 Victorian Shell & Seaweed pattern satin glass rose bowl in purple shading to a pale amethyst coloring. Interior of bowl is a cased white and the pontil is fire polished. 5 1/2" diameter, 4 1/2" tall.